This butternut squash sauce is fantastic on toast, pasta, roasted vegetables, grain bowls and beyond. You can make a batch and store it an airtight container in the refrigerator for up to 3 days. Peel and cut the butternut squash into small chunks. Toss them with 2 tablespoons of the olive oil and pinch of salt and pepper. Lay them out evenly on the baking sheet and roast for 30 minutes or until very tender and browned on some pieces. Meanwhile mix together the white beans with the remaining olive oil, green onions, parsley and lemon juice in a small bowl and set aside. When the butternut squash is done roasting combine it with the water, cashews, garlic powder, turmeric, paprika and a pinch of salt and pepper in a blender and puree until totally smooth. 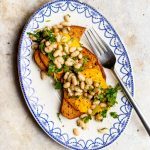 To assemble toast the bread, pour on the butternut squash sauce, layer on the beans and add more salt and pepper if desired.